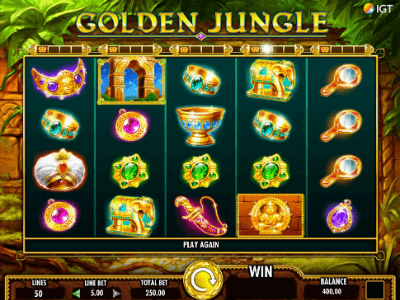 The new Golden Jungle slot has a lot of winning lines, which is somewhat uncharacteristic for IGT company, but this gives players more chances to collect a winning combination. The slot is decorated against the background of the Amazonian jungle. Themed characters and stunning 3D graphics take you to the very depths of the wild forests. In the new slot, you will also have the opportunity to choose the soundtrack by yourself, these can be sounds of wild nature or humming of the drums. As it was written above, the slot has thematic symbols: cobra, crocodiles, bears, elephants, and tigers. The latter (tigers) are the most expensive in the slot and can bring a win of up to 150 coins per game line. If we talk about bonuses and special functions, there are quite a few of them in the newest slot machine. Firstly, it's random bonuses, for example, the function of flying butterflies can start at any time of the game and, getting on one of the top characters, will fill the entire game reel with them, so you can get a huge prize. The free spins function is triggered when three or more scatter symbols appear, which look like a beautiful purple flower. In this bonus mode, you can select the animal that will become the main character in the game, and get up to 20 free spins. The more expensive the symbol is, the less free spins you get, but it's noteworthy that the function of flying butterflies can also be activated and at the moment of the bonus game. You can make a logical conclusion that the Golden Jungle slot will definitely win popularity among gambling players due to its extensive functions and bonuses, and the fact that the slot machine has the possibility of multiplying your initial bet by several times will make a good profit. To date, this slot is popular in Canada, because the inhabitants of this country can enjoy playing it without any restrictions. Feel free to try your luck and adrenaline from a walk through the living jungle!